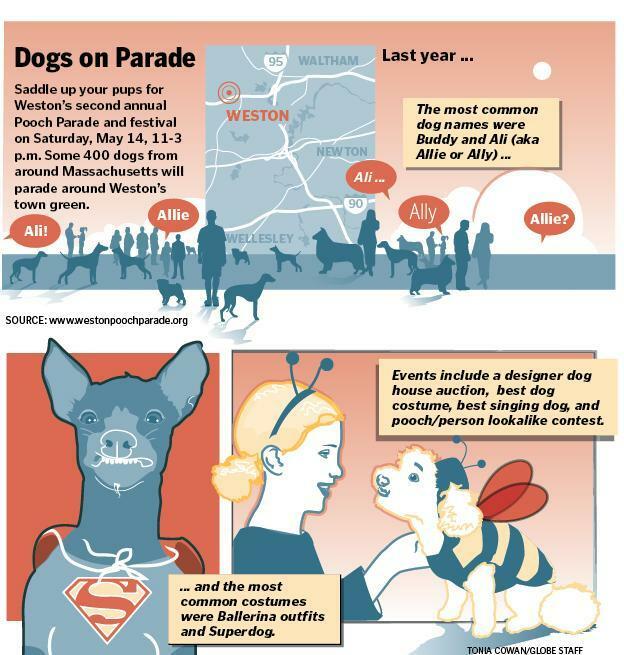 Saddle up your pups for Weston’s second annual Pooch Parade and festival on Saturday from 11 a.m. to 3 p.m. Some 400 dogs from around Massachusetts will parade around Weston’s town green. Other canine-centered events include a designer dog house auction, best dog costume, best singing dog, and pooch/person lookalike contest. • Most common dog name: Buddy and Ali (aka Allie or Ally). • Most common dog costumes: Ballerina outfits, Superdog. • Most common dog breed: Golden retriever, labrador.